Saul Richardson, B.Ed (Hons), MACE. 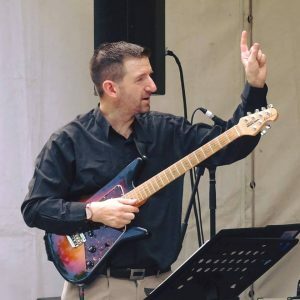 Guitar teacher at JWA. We give great guitar lessons to children and adults in Crows Nest. 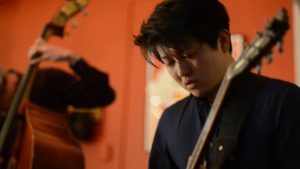 We are Saul Richardson and Yutaro Okuda, experienced music educators and guitar teachers. Beginner lessons: get off to a great start with good technique, essential knowledge of the instrument, and music reading. Jazz guitar lessons: we are both jazz players, but of course play and teach other styles too. HSC music preparation: we can help get your child through HSC music performance with their best chance of great results. Intermediate and advanced lessons. We don’t run out of things to teach you. Individualized programs for each student, and planned lessons that follow a logical sequence. When is the best time to start guitar lessons? Firstly, it is never too late. You can start at any time! For children, we find that age 7-8 is good for starting, but if you start later that isn’t a problem. for a student to be really good by the time of HSC music or university auditions, realistically several years of experience at least are usually essential for a chance at top results. The earlier the better. Young people you hear who are really good at guitar typically start quite young. it is a serious instrument with lots to get through and learn, so starting sooner rather than later is recommended. Should my child start on a real instrument first, before starting electric guitar? No, unless they really want to try something else first. In our lessons at JWA, the guitar isn’t a toy or a lightweight (or “lifestyle”) instrument. We take it seriously and are interested in teaching people well so they become great at playing it. There is lots of structured work to get through. If guitar is to be your child’s instrument, a year spent being forced to play something else could just be a year lost. For very young children, before age 7 or 8, starting on something else can be a good idea. Piano, drums, violin, and singing are often good choices. They teach useful skills and develop a child’s sense of pitch and/or rhythm. These skills are helpful for learning other instruments later one, including electric guitar. Oh, and of course electric guitar is a “real” instrument! We’re a bit offended that you even asked. Often it is taught as a toy, but not by us. 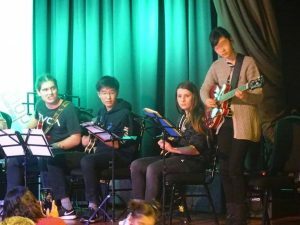 What great opportunities do JWA guitar students get? JWA guitar students on stage performing. Are you in Crows Nest? I thought you were in St Leonards. Well, we straddle both suburbs; our studio is on the border. All our lessons are in The Jazz Workshop studio at 58 Atchison St (1st floor). It is five minutes from St Leonards station towards the Crows Nest shops. There’s lots of parking on the street out front and nearby, much of it free. There’s a 2-hours-free council car park close by and buses are not far at all. How can I or my child start guitar lessons at JWA? You can use the contact form on this page, or use the more detailed enquiry form. Of course you can email JWA info@jazzworkshopaustralia.com.au directly, or even phone (02) 9966 5468. You can book a single lesson online if you’d like to try us out first. We’d love to hear from you, so do get in touch. Email us info@jazzworkshopaustralia.com.au, call us on (02) 99665468 or use this form and we'll get back to you.